RaspyFi is an open source linux distribution. 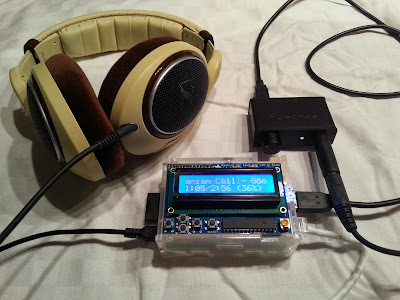 It will transform your Raspberry Pi into anaudiophile source, in 10 minutes without hassles. It comes ready to play, and it’s compatible with almost every USB DAC available. This was perfect for me because I had for some time been thinking of building some kind of "music station" that I could use together with my NuForce uDAC 2 and my Sennheiser HD598. I was thinking about using an old laptop but an Raspberry Pi is even better. Small, quiet, power efficient and just very cool. After writing the image to an SD-card I was playing music within minutes and it worked great! I controlled the music from a web-browser and my Android phone which was ok but it made me start thinking about building some control functionality into the device itself. Then I realized was that I had the solution in one my electronics storage boxes! I had a Adafruit Blue&White 16x2 LCD+Keypad Kit for Raspberry Pi that I didn't had time to put together earlier. After some soldering I had a nice display with five buttons on top of the Raspberry Pi. The soldering and software installation was very easy thanks to Adafruits excellent user-guide that can be found here. The last piece of the puzzle was to display song information on the 16x2 LCD display and use the keypad to control the playback. First I was inspired by this thread in the RaspyFi forums, they used lcdproc and mpdlcd but I didn't find drivers for the Adafruit LCD and I didn't feel like writing my own drivers (maybe its not that hard?). Instead of using something "ready" I decided to make my own "driver" based on a simple python script using Adafruits python library for communicating with the display and the command line program mpc for communicating with mpd. # We add five extra spaces between each complete text scroll. # Two iterations of this gives us 400 ms.
Video of the display in action. That is left to do is to assemble my PiSupply kit and connect to the wireless network using an USB WIFI dongle and maybe mount all parts in some clever way. Hi, I like very much your article !!! Some day I will implement the display brightness but I cannot say when it will be ready. Hi, this is a great addition however it does not work for me. I did change crontab, since that did not give any result I edited /etc/rc.local, that returned an error: Permission denied. Any suggestion how to start Python script? It is strange that the crontab start didn't work. Maybe Raspbian has been updated since I wrote the guide. I have not updated the SD-card I use for this for a while.